An 80th birthday is a very special occasion. 80th birthday party ideas should be fun for all ages, and appropriate for celebrating such a milestone. Planning a birthday party for an octogenarian is a wonderful way to focus on the life and experiences of the guest of honor. 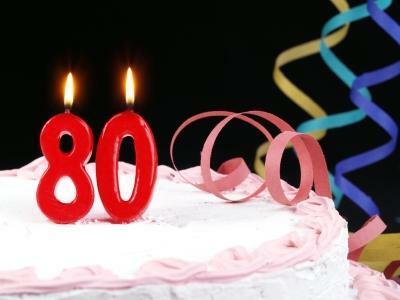 Turning 80 is no small feat, and you'll want to celebrate accordingly. There are a few general things to keep in mind while coming up with 80th birthday party ideas, however. 80 year olds differ a great deal from person to person. Consider the overall health of the birthday boy or girl, as well as the guests, and plan activities accordingly. An afternoon party is usually better than one that will run into the late evening. Consider dietary restrictions and food sensitivities when planning the menu, and offer alternative options for those who need them. Make sure the venue is accessible to all. If there will be people in wheelchairs or otherwise unable to climb stairs in attendance, ensure that there are ramps and elevators in place. Have separate activities for children who will be at the party, as they will want to let off a little steam. Having something planned for them to do will keep them from running around underfoot. Plan the party well in advance so that you'll have time to gather photos, get in touch with everyone you want to invite, and organize the event. The party should be catered to the special guest who is celebrating his or her 80th birthday. Here are a couple of ways to make them feel special and get everyone involved in party planning. Ask everyone who will be at the party to bring along a photo of the person celebrating the birthday. These photos, put together, will tell a story of the person's life, including all of his or her loved ones and the major events that shaped the past. Hang the photos from bulletin boards, streamers, or large pieces of craft paper and display them during the party. After the party, put the pictures together in an album as a special memento. You can also ask guests to write down a special memory or funny story about the person having a birthday. These stories can be gathered together and presented to the guest of honor, or you can ask those with especially poignant or funny memories to read their stories during the party. Do some research online or at your local library to find out what the fads were at that time. Using what you've learned, choose decorations to reflect these fads and styles. Serve food that was popular during the year or decade that the person celebrating a birthday was born. Use images of pop culture figures, product advertisements, and other famous brands or people as decorations. Find out what music was popular at the time, and play it in the background. Make a list of what common household items cost during that year, and hang it in a prominent location. Other lists can be fun to add as well, including famous people who were born in the same year or decade, notable inventions of the time, and ways that life was different or simpler. Make sure the theme is also reflected in the birthday party invitations. Whether it's a large gathering with friends and family from both the past and present, or a small family affair, an 80th birthday party is a special celebration. Take time and care to ensure that the birthday celebrant will enjoy the party and have the opportunity to share special memories with loved ones.